Talk about paradise. Hilton Head Island—home to family-friendly beaches, first-rate fishing, spectacular dining options, world-class golf, and precisely the kind of vacation vibes that you’re looking for. If you’re in need of a getaway but you don’t want to break the bank, Hilton Head Island has options that will go easy on your wallet. From affordable lodging to reasonably-priced bike tours, here are the best budget-friendly vacation ideas for Hilton Head Island. It’s no secret that Coligny Beach is one of the hottest destinations on Hilton Head but if you want to skip some of the crowds, stop by the beautiful Folly Field Beach Park. The beach features seasonal lounge chair and umbrella rentals, a boardwalk, showers to rinse off after a day in the ocean, and affordable metered parking. This serene destination with white sands and sparkling waves provides a scenic place to sunbathe or enjoy beach games with the family. If you’ve worked up an appetite after a day on the beach, Palmetto Bay SunRise Café is the perfect option for a hearty, reasonably-priced meal. For breakfast, try the to-die-for Shrimp Hash made with sautéed shrimp, peppers, onions, and broccoli with hash browns topped with two eggs (any style) and hollandaise sauce. Lunch options range from a yummy potato crusted flounder dish to mouthwatering crab cake sandwiches. With friendly service, a down-home atmosphere, and good prices, Palmetto Bay SunRise Café is the ideal place to fill up your belly. While lodging options abound on Hilton Head, none give guests a bang for their buck quite like the Red Roof Inn. Guests will be greeted by a warm and welcoming lobby with free coffee and a relaxing outdoor pool. At the end of the night, lay your head down on comfy king and queen-sized beds in rooms featuring flat screen TVs, works desks, and mini fridges. The Red Roof Inn is also conveniently situated right by excellent golf opportunities, nature tours, shops and restaurants, the airport, and much more. Visit their website for prices that you just won’t find anywhere else in Hilton Head. If you’re visiting Hilton Head, it’s essential to gain a deeper understanding of the island’s history. One of the best ways to do so is through the Gullah Heritage Trail Tours. These fascinating tours paint a picture of the West African culture of the Sea Islands across North Carolina, South Carolina, Georgia, and Florida. Learn about the traditions, beliefs, art forms, and family life over many centuries. The tours only cost $32 for adults and $15 for children 12 and under. For only $4.50 per person (children ages five and under are free! ), climb to the top of the magnificent Harbour Town Lighthouse. 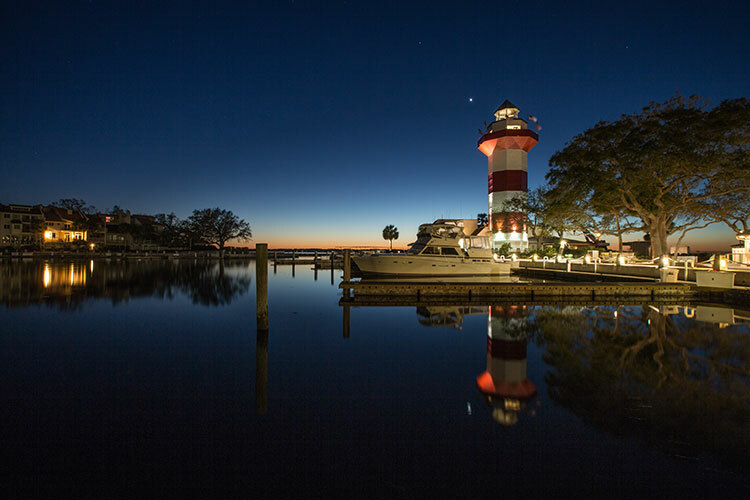 The vibrant red-and-white-striped lighthouse has only been around for a few decades but serves as a significant landmark for Hilton Head Island. Visit the museum and check out the informative Coast Guard exhibit. Be sure to climb to the top for some picturesque views. Hilton Head is a birdwatcher’s oasis. And Pinckney Island is the prime spot to observe the area’s flourishing wildlife. Birds in the area include the painted bunting, white ibis, osprey, Northern mockingbird, American robin, song sparrow, red-shouldered hawk, pelican, and a variety of egrets. Bring your binoculars and gaze in awe at the diversity of wildlife at Pinckney Island. One of the (many) great things about Hilton Head is its accessibility for bicyclists. Hilton Head Outfitters has rentals for beach cruisers, tandem bikes, kid’s bikes, and more. The island of Hilton Head boasts more than 80 miles of trails to explore and this is the perfect affordable family activity. Twenty-six-inch beach cruisers can be rented for just $24.99 for 24 hours. Check their website for a breakdown of rates. Your little ones are going to fall in love with the Coastal Discovery Museum. Explore trails, gardens, butterfly enclosures, and much more with the whole family. Tours and talks are held regularly to educate your child and family on local culture, wildlife, and heritage. The Coastal Discovery Museum fills their calendar with all kinds of events ranging from dolphin cruises and birdwatching to kayaking and salt marsh adventures. Keep up with their website to find out what’s going on when you visit Hilton Head! In the mood to unwind with a cold drink? The Hilton Head Distillery is your spot (That is, if you’re part of the 21-and-over crowd). This small-batch handcrafted rum and vodka distillery combines time-tested distillation techniques and modern technology for an out-of-this-world-good result. Visit their tasting room to enjoy a flight of options with a complimentary souvenir glass for just $15 per person. Now it wouldn’t be a trip to Hilton Head without some golfing, would it? Head to the Golden Bear Golf Club to play a round of 18 holes for as inexpensive as $34! This Jack Nicklaus-designed course is open to the public and boasts pristinely manicured links. Practice your swing among rolling green and enormous pine trees. You really won’t want to leave this spot.